It's not secret that every influencer or fashion blogger in this world has to edit their pictures somehow to achieve great quality content and impact visuals both in their sites and social media platforms. I'm tired of seeing SO MANY fashion blogs that absolutely lack in quality pictures, where their bloggers post the exact same picture in the same spot repeated almost 9-15 times per post, and where lighting and angles are far from being great. That doesn't appeal nor even invite me to keep reading a fashion blog. And I say this because I'm a geeky, insupportable perfectionist girl versed in visuals and architecture, who loves caring for detail and whose fashion blog pictures aren't taken by professionals in any way, but instead, shot by friends and family who are always kind enough to do me a huge favour into this. In today's post, I want to show you that if you have a fashion blog (or blog of any sort) or at the contrary, you are planning on becoming an influencer or just planning on boosting your social media accounts, you don't need to splurge all your savings in a professional equipment or photographer. 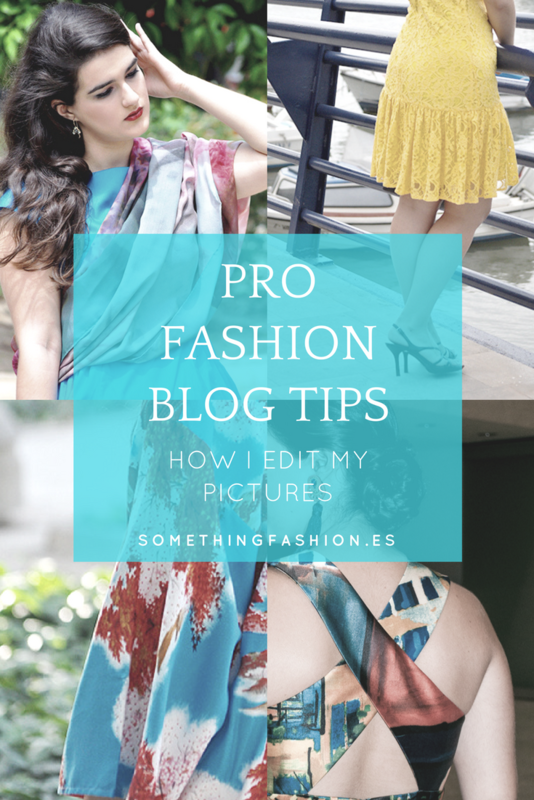 You just have to be a bit more thoughtful when it comes to the content you share, and pay a bit of attention to these little tricks I'm going to share with you today to achieve a PRO fashion blog. I've even shoot the pictures for the blog by myself sometimes, with a tripod and a remote. So, let's get started! 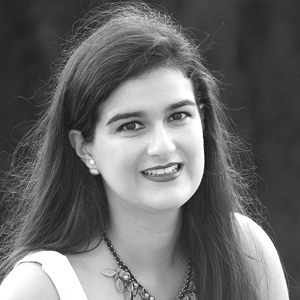 How do I edit my pictures and what is my advice for achieving a great quality fashion blog? Dark is your worst enemy E-V-E-R. Specially when shooting fashion, as you'll have some serious issues when moving around and getting some dynamism in your pictures, as they'll get all blurry and confusing. Not nice. In fact, if you ever get close to nice quality pictures, you'll have to spend endless hours editing them, as I did in one of the last collaborations I shot for Lightinthebox. Instead, try shooting while in the Golden Hour (just a bit before the sun sets) or early in the morning, so you won't be under direct sun but still get awesome fashion blogger pictures with nice and soft hues and no harsh angles at all. Greens are the worst tones whenever I try to print anything related to urban planning or architecture floor plans. It's super difficult to balance and smooth them out, and they always seem to look wrong. The same applies to fashion pictures: greens, oranges and reds always seem to stand out A LOT. It's not bad to give them the main character spot if they're under control anyway, but let's say that desaturating them a bit with your photography software will balance the whole picture and keep everything coherent. This is actually quite personal but, I prefer low saturated pictures where the colors doesn't draw much attention. Not to the point of getting rid of the pictures' hues at all, but I prefer going for subtler, softer colors than striking ones when it comes to the pictures in this blog. I always try to find that balance between luminosity, great exposition and great colors but still trying to achieve that soft look of colors that doesn't stand out much. Kind of tricky! Coming back to the point above, exposition and luminosity are great, but be careful with overexposing your pictures! When you take pictures under direct sunlight you better master the technique or have mind blowing retouching skills, or you'll end up without corners in your pics (which will be replaced with a lovely white stain), white parts where there shouldn't be any, too much reflections... That sort of things. Instead, when shooting in direct sunlight or noon, try taking your pictures under a shadow (as, under a tree or a high building which projects some sort of filtered light) or instead, find a great porch or lobby litten up enough but without sun rays entering directly. Pictures whose backgrounds are unclear, full of diagonal lines or uncentered subjects are a big NO-NO. Kind of a mania as well, but I always look for refined lines and proportion so, besides correcting skin flaws which appear sometimes, looking for real horizontality at the horizon line (no matter if it's a wall behind you, or the actual horizon!) and verticality in façades and props surrounding me, with Photoshop's tool "skew" its super easy to achieve those, which will add not only quality but also professionality to your fashion blog! Also, sometimes trimming the picture helps not only on focusing both in the subject or the fashion item you are trying to highlight, but is also helpful when getting rid of unexpected aspects appearing at the background like, people staring weirdly, cars or vans, trashcans and other urban mobiliary. Not the best solution anyway, but sometimes it's helpful when finding the true purpose behind the picture as well. Tell whoever is taking your pictures to play with different angles, or take advantage of the background or place you're in to be part of the photoshoot! Why not climbing up those stairs to take the picture from below? What if you put your tripod a little bit higher or you sit on the floor to take a detail pic of your shoes? As well as in the angles, try learning a couple of poses so you can vary and not only change your facial expressions, but also showing how the fabric or the shape of the dress/pants/whatever you are wearing act when walking, jumping of sitting on a bench. I personally have searched before for videos like this starring professional models as Coco Rocha, and where they show up some interesting or fun poses to try. And I said TRY, because you don't want to end up cracking your leg or anything when posing for pictures to be shown at your fashion blog! Yes, I know. Shooting pictures when going on a walk any regular day, trying to figure out where to carry the camera plus sporting those ah-wesome high heels you can barely walk in (I know what I'm talking about because I've been there too) it's tricky enough as to trying to shoot pictures for your fashion blog in different locations around the city. As if! My point here is, even if you are not in the mood of shooting a whole editorial around your city/town/neighbourhood try to at least change the angles and backgrounds you're posing in. If you are in the middle of a bridge for example, try to take some shots at one of the sides and then in the middle. Or cross the street and walk casually to the camera. Or go to that amazing vintage door in the building in front of you and take some pictures grabbing the doorknob. As I said in my post of "10 things that will make you look better in front of the camera as a fashion blogger", find props and interact with your surroundings, so not all your pictures feature you in the same exact location only varying your facial expressions. Much better, huh? I'm so, so tired of fashion blogs featuring outfit pictures of their bloggers in the exact same poses and backgrounds. They get to share almost 10 to 15 head to toe pictures of them which I must say, doesn't have anything cool at all. I don't know about you, but I want to see not only how well that dress fits the model but also tiny details as the buttons, or maybe a zoom into the fabric or pattern, or how tall that shoe actually is... I don't know, but I want some variation! My advice here for killer fashion blog pictures is always look for the unexpected in your outfits, like, how flowy the skirt actually is when you walk away, or the tiny necklace or earring you are wearing and which at first view might be unnoticeable... Not only the whole package counts when shooting pictures for a fashion blog, but attention to detail is key as well. 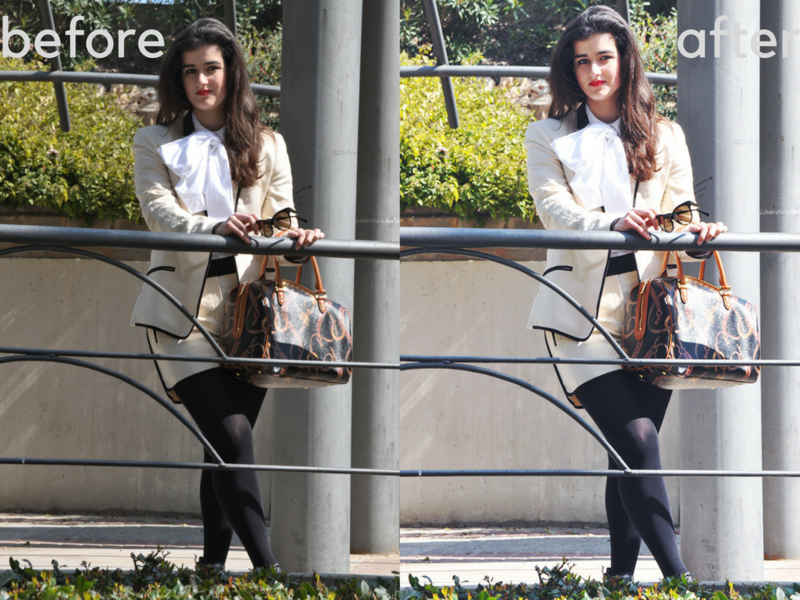 BONUS #1 What software do you use to edit the pictures at Something Fashion? 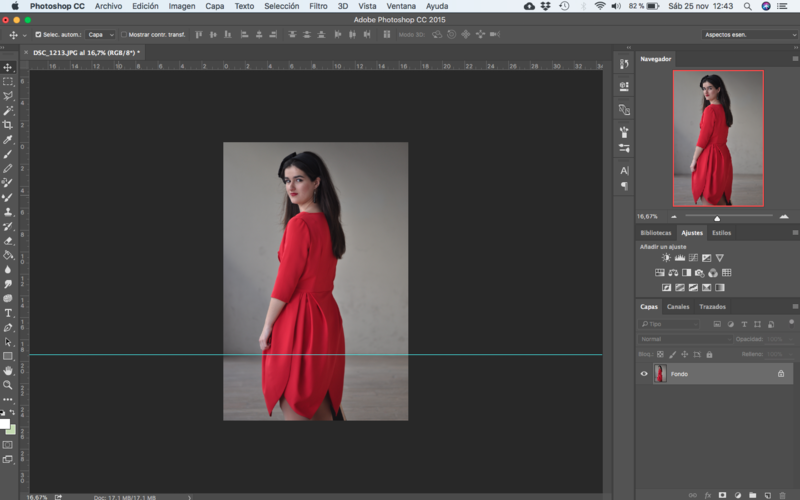 I've been using Adobe Photoshop CC 2015 for awhile, not only because I also use it for architecture projects and renderings and that has allowed me to have some serious skills at it, but also because I love the easy workflow, the very few time you have to spend there editing to achieve great results in comparison, and also because of the Camera Raw tools panel, which has improved dramatically the blog's pictures since the first day I started using it. 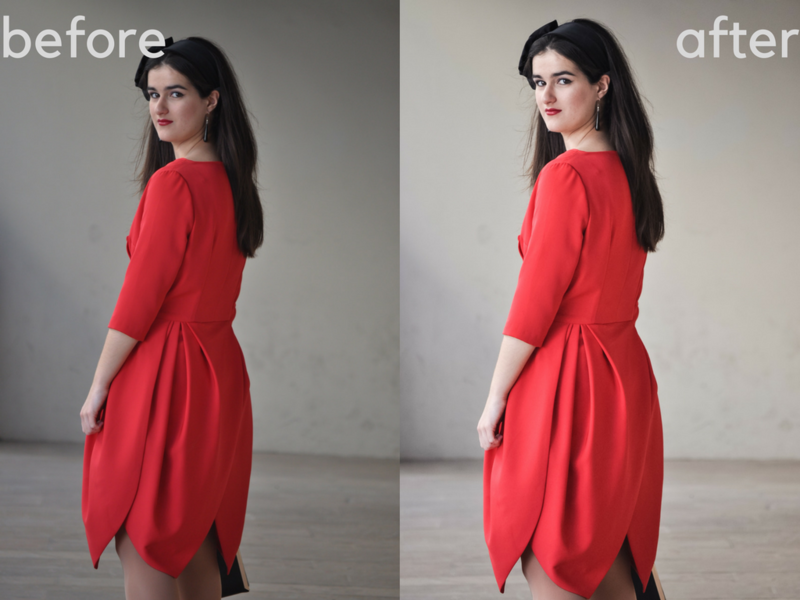 BONUS #2 What camera, lens and presets do you use to shoot fashion pictures? The first posts here at the blog were shot with a little Canon PowerShot point-and-shoot, and even with the shabby webcam my laptop back then had. Such a mess. Then, I got the Nikon D5000 DSLR as a gift, and I never again got apart from it. It came with two lenses which I usually carry around and which I change depending on the lighting, the exterior conditions or what bag size I'm carry in that moment: one is the NIKKOR 18-55mm and the other is the Zoom-Nikkor 55-200mm which may not be the ideal lenses for shooting portraits or fashion pictures (that's what I've been reading in different sources), but they are quite handy. A couple of weekends ago we took an early bus Firenze-Genova to discover one of the biggest coastal cities in Italy, home of pesto sauce and (oh dreamy) focaccia. As I've done in our previous daytrips around the country during these three months, I decided to wear something as fashionable as comfortable and warm enough to deal with an uncertain weather and a long day of walking and touring ahead. Carrying a light, neutral but still warm coat as this Lightinthebox one I'm wearing is as important as carrying a bucket bag in which you can store everything you'll need in your day trip around any Italian city: wallet, smartphone, tissues and so on. 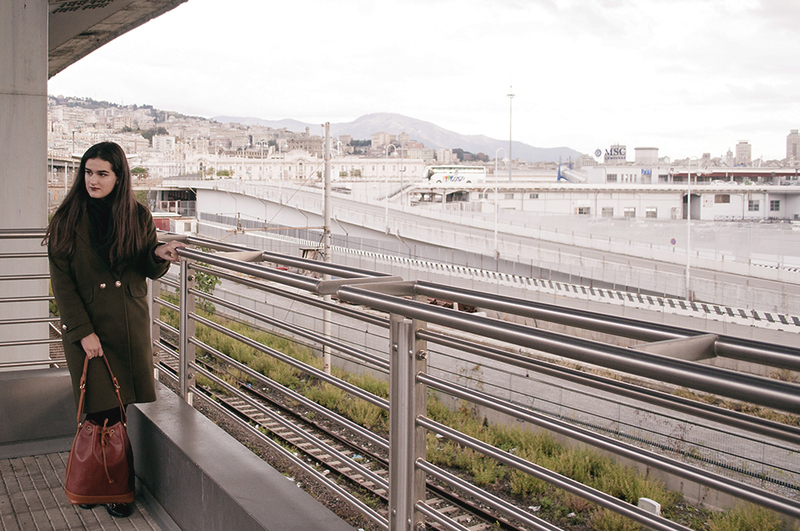 So, what did we do around Genova and what impression left on me this huge, historical city and its surroundings? Well, Genova it's way bigger than I expected, much bigger than Firenze but less touristy (or at least, less touristy when it comes to foreigners, because it was plenty of Italian families with their children) and there are plenty of marvelous sites to discover and take pictures in: Genova's Palazzi, its many University buildings, its commercial promenade covered in ah-mazing porches, both of Genova's ports... For a tiny moment, I kind of regretted being in a city which isn't as big as Liguria's main city and dealing with tons of tourists everyday in my way to class. But then, we all came back late at night to Firenze and I again felt really grateful that I'm having the opportunity of studying in the Renaissance capital for a year. But anyway, I'll stop talking about nonsense and focus on the outfit. I'm still a bit doubtful when it comes to dressing up to stroll around Italy: the fact that my choices here are a much limited comparing to when at home, summed up that I can't figure out the weather (it changes like a crazy thing every-single-day) and added to the fact that you better wear comfortable walking shoes just makes everything complicated. My advice here to keep safe and warm would be wearing tons of layers: a T-shirt underneath a pullover, maybe a blazer if it's too cold and then your perfect go-to coat. 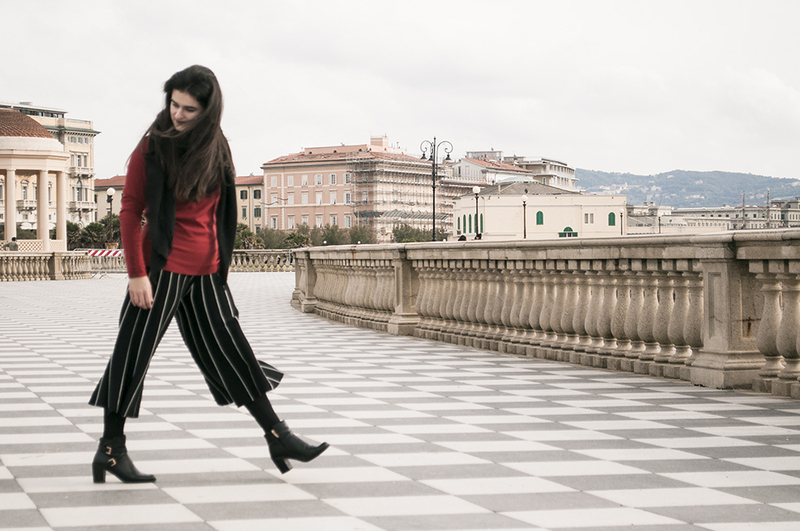 A pair of jeggings, culotte pants with tights or even your favorite jeans are great to complete an Erasmus-proof outfit to survive endless adventures while being abroad. So... Have you ever visited Genova or any city around Liguria or even Italy? What's your perfect outfit to stroll around when being abroad? I had a slight beforehand idea that, when you are living abroad for a whole course, you are expected to travel. And travel to exhaustion specially if you are in a country as culturally rich and marvelous as Italy. However, the budget is pretty tight, and being based in a city like Firenze which doesn't have an amazing connection to other European cities if not taking a 6 hour bus doesn't allow me to travel every single weekend to an "exotic" destination like Bratislava or Bucarest. 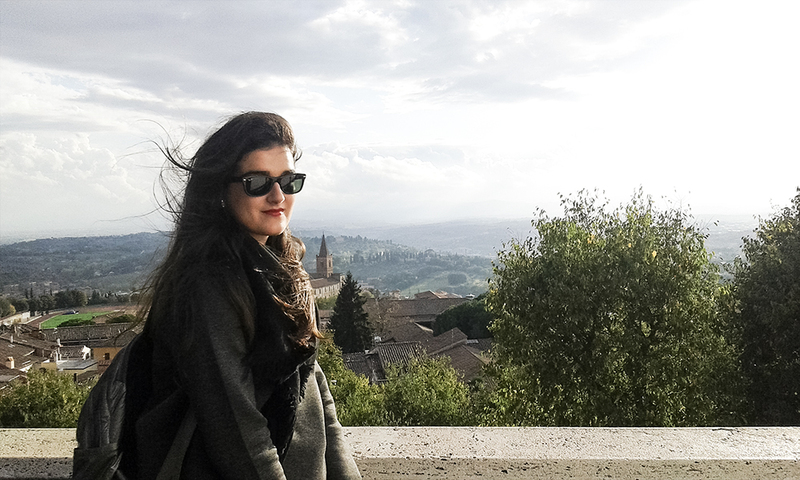 However, Firenze is an amazing location to do an Erasmus year if you want to discover the best places in Italy, because it has great connection with both the south part of the country and the north. You can reach Milano and Rome in about two hours of train, and amazing and less touristy places like Lucca or Arezzo are just turning the corner. So, as my flatmate and I have developed a great friendship we decided to take a train to a place near Firenze to do some sightseeing. Both of us share passion for travelling and eagerness to master our skills in italian language and culture. She is the one behind the camera while in Italy, and the one who always agrees in enrolling a crazy daytrip to take pictures and discover new places to eat delicious food. This time, we took a train to coastal city Livorno, which is amazingly close to Firenze but at the contrary of what you might think, is not touristy at all. We strolled through the historical center and took some amazing pictures at Terrazza Mascagni near the seaside. 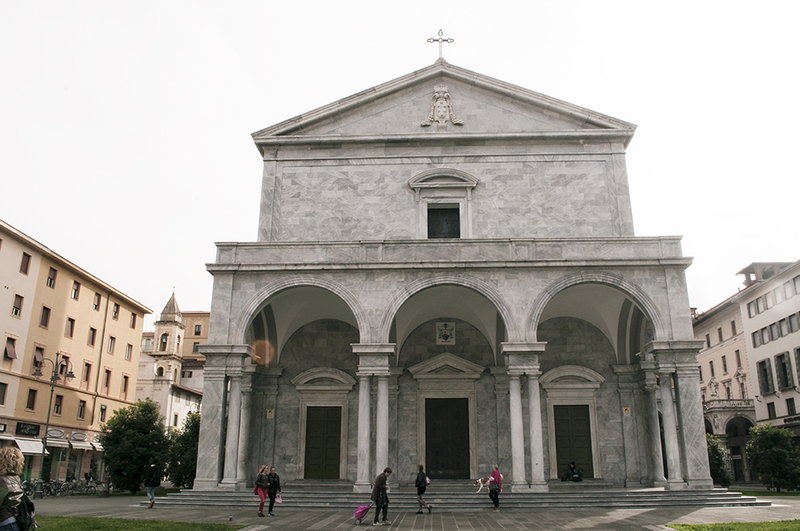 We spent the whole morning entering in diverse churches, visiting Livorno's historical forts, had lunch near the beach and finally head over Pisa to take pictures with the Leaning Tower and Cathedral, which has a pretty breathtaking interior. To stroll around I wore this Silvian Heach culotte pants that I bought on our last tour through the nearest mall, which are pretty comfortable and super versatile, as I can wear them with thights and warmer socks to turn the whole outfit into a Winter-friendly look to wear around European cities. I think we're actually having sort of strange weather around here, because it's almost December but it's not as cold as everybody told me it should be. That's why I always carry with me my basic blazer jacket and envolvent scarf. I don't want to freeze but neither to carry around useless stuff I can't put on! Packing for a whole course abroad is difficult and nerve-wracking enough to start figuring out the thousand situations in which you'll have to wear that coat or if you'll ever wear your high heeled shoes. If you also add the stress of dealing with baggage limit present in all low-cost European airlines, you'll probably end up with a headache for at least a couple of months prior leaving to your next destination. Instead of that, do as I did and not only plan ahead of time (seriously guys: it's almost IMPOSSIBLE to figure out a year full of different situations and events in just three days) but also get some versatile pieces for your closet abroad to be flexible, chic and ready to rock any cobblestoned streets you might find in your way! I will never stop counting the many perks of carrying with you a huge scarf. Plus points if it's made of wool or anything cozy to keep warm in freezing European Winter. Scarves are amazing pieces to carry on your luggage for your year abroad, because you can pair them up with anything, use them to cover up when visiting some monuments, wear them in different ways as turban or to tie up your hair in a ponytail. 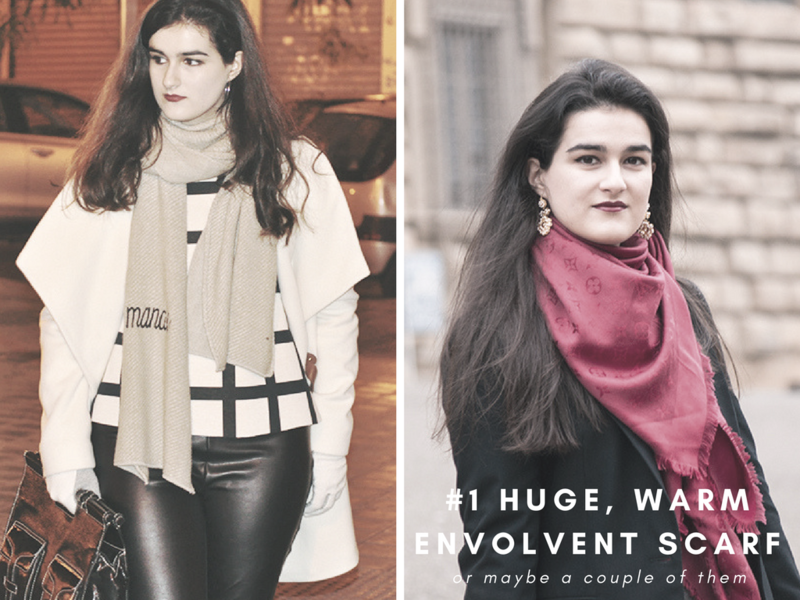 I already showed you some ways to sport your shawl or envolvent scarf at the Something Fashion x Louve de Nordneg collaboration we shot a couple of years ago, check it out! And nope, when I say walking shoes I'm not referring to sneakers or sport shoes necessarily! Walking shoes can be low heeled booties, a pair of velcro sneakers with thick sole and jewelery attached or a pair of flats. Here, I must confess that I totally screwed it carrying too many flat ballerinas which aren't comfortable enough to walk through italian streets, as they get in between the cobblestones and sometimes they flip. In that case, now my favorite pair of walking shoes to stroll Firenze are Zaful's rhinestone slip-ons and the rain booties I purchased at Bata. European winters are, like, the worst thing ever. I came to Italy from a coastal city which has this microclimate with temperatures not going below the 9ºC near January, and where you can sport easily a medium coat and a pullover without freezing. Now, I'm living in a city near the hills, upper in the map referring to Valencia and where people has adapted to cold in an amazing, super stylish way, sporting fur coats and super cozy pieces worth any catwalk. So, my advice here for your closet abroad is that, except if you're traveling to the tropic, bring a warm but light coat (you don't want to exceed the weight limit in your baggage!) in a neutral color, like light brown, military green, black or grey. This way, you can wear it in different ways only changing your hairstyle and accessories! My Noé bucket bag is my absolute go-to when I don't want to carry around my huge school bag where I usually carry the laptop and all the university stuff. It is big enough to carry a few necessary things when living abroad and going for daytrips, as a portable umbrella, my wallet, a couple packs of paper kerchiefs, smartphone and so on ("what's in my bag living in Italy edition" anyone? I can see it already). If I were you, I would take with you one or two medium to big sized bags comfortable enough to carry around, but still with enough spare space to store those things you'll need any moment or in any possible emergency. 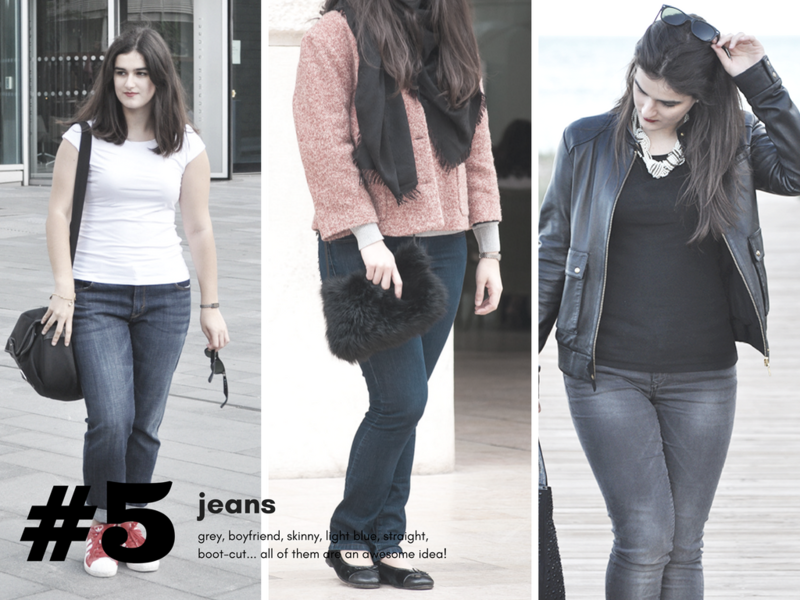 Jeans are always a great idea! 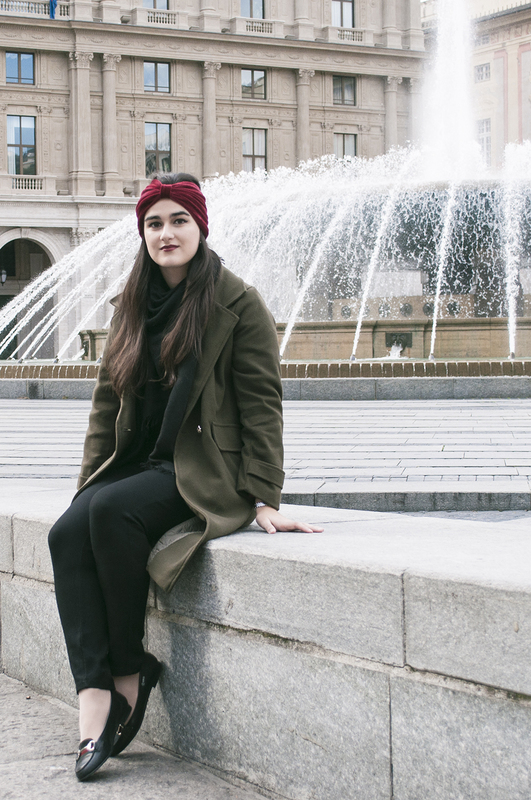 Although they aren't made of the coziest fabric, you can always pair them up with lots of upper layers to stay warm while traveling and living abroad. Scarves, longer coats, furry boots... Jeans are super versatile and useful to stroll around comfortably in a low-maintenance key outfit, because jeans are super easy-peasy to wash, quick drying and they don't usually need ironing! Put at least a couple of them in your carry-on for your next trip. You can't be wrong. When living abroad you'll be likely to go out. Like, a lot. Or, if not actually going out, but you'll get invited to places, like dinners and parties at other abroad student flats or you'll even get the chance to organize your own! My advice here is staying classy and find a dress as a little black dress which allows you to wear lots of different layers both underneath or over it, as well as doing the pertinent Season change. Pick something that doesn't have any super thick fabric, but not something too thin or see-through (you don't want to freeze, remember?). The key here is being able to wear your dress in as many occassions as possible doing minor changes and accessorizing differently. If I'd had to pack again for my year in Italy, I would pick at least a couple of white shirts again. Over, and over again: it's a basic piece that my closet abroad couldn't miss. Be it an interview (I'm having my first job interview abroad next week on a studio, and this white shirt will come in quite handy for sure!) or for a more formal event which doesn't require dressing too much (as a presentation, any kind of congress, meet-up, party... Whatever!) a white shirt is always a nice piece to take with you. Festive Winter outfit? Say yes to the (velvet) dress! Ah holidays. That time of the year when streets fill with tons of Christmas markets, and there're sweets and amazing food no matter what country you live in, and cold and chill stays the whole day... Well, that's about to come very soon! For the first time in my life, I will be "coming back home for Christmas" this coming December, and I'm sure everyone will expect of me to go back to Spain not only with tons of experiences, fun facts and a bit of italian in my tongue but also, loaded with new fun-tastic outfit ideas and crazy wardrobe changes with some florentine flavor attached. I can't wait! So, now I can finally assure you that Firenze belongs to northern Italy, and that means that it's a much colder città than I ever expected. I was warned long before the chill arrived, because every single window in every single shop downtown was filled with fluffy fur coats and cozy sweaters I would have never imagined wearing back home. That should have given me the idea of what was about to happen in late October/beginning of November. But, as innocent as I am, I didn't trust those first signs and kept going out every day with my light sweater and blazer jacket because, "it's OK, it's sunny outside and the birds are singing around". WRONG. It's cold, deal with it. Even in this amazing pictures my friend and I took at the Tepidarium Roster here in the Giardino dell'Orticultura while being sunny and lovely. That's why, my advice is... Why let cold beat you instead of battling it face to face with a warmer outfit? It's precisely in holidays and festive Winter days that one of the things I miss the most is pairing a cool, flowy maxi dress with just a pair of sandals and a nice purse. Well, with this green velvet dress I got from Lightinthebox now I can achieve that without freezing while staying super in-style. Velvet always feels so cozy, so classy and kind of glowing that it doesn't only travel me back to holiday memories, but also makes me want to show everyone that fiorentine je-ne-sais-quoi ligated somehow to amazing fabrics worn for centuries here, and that I'm trying to acquire every single day I spend in this city. 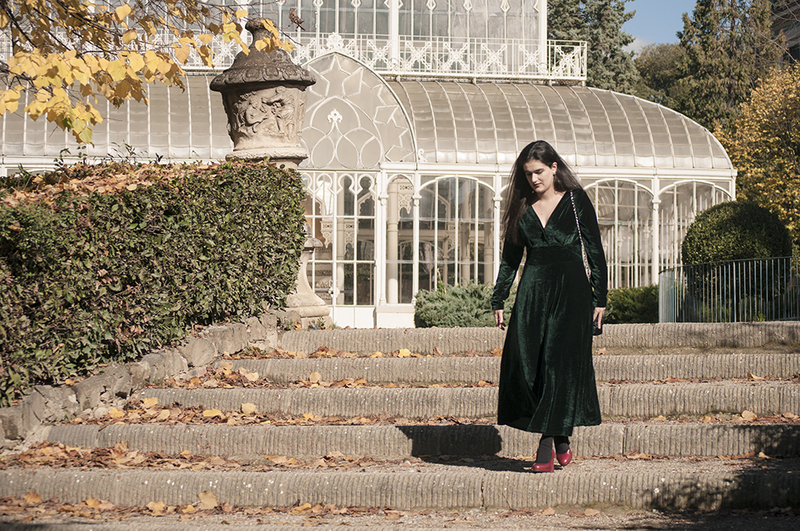 So, a velvet maxi dress might be one of the best ideas I've ever had when picking a Winter-proof outfit that will also help me get through a long flight and crowded lines at the airport. Coming back this holidays is a perfect excuse to rock a great outfit! Did you know that Lightinthebox is hosting a massive Black Friday SALE this November? 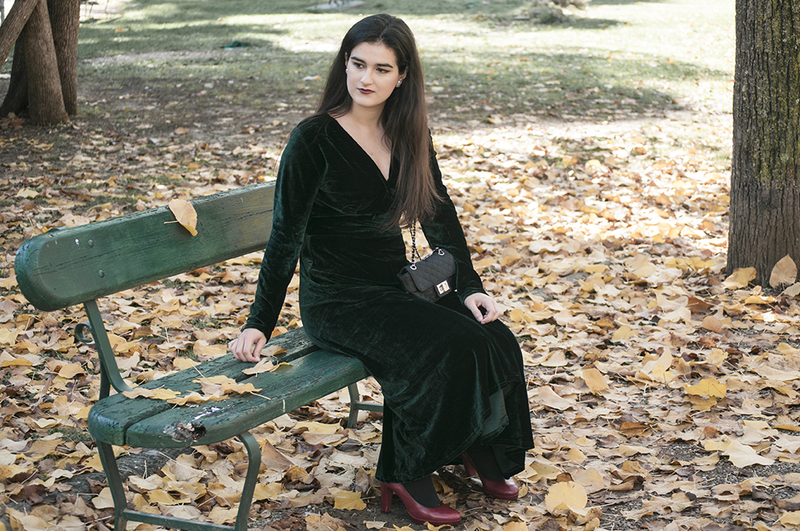 Check their discounts and get your own velvet dress to rock this Season! I know from (oh magical) stats that many of you come mainly from across the Atlantic Ocean and many other places across the globe. Those of us who where born and have breathed Europe for all of our lives (although is no big deal actually), know a little bit what's like to visit crowded historical centers, battle with ancient floorings no matter sunny or rainy (hi, my beloved clobberstones!) and entering mesmerizing churches without being kicked out because of dress code (which happened to me, eventually, some years ago). So, today I wanted to show you along with this pictures we shot last week at the Mercatino della Belle Epoque here in Firenze some useful tips that may apply to what to wear when traveling to any European city and, if not being identified as a tourist at least, help you blend in with locals a bit easily. Trust me! It only took me a week to be taken by an actual fiorentine and, you'll get extra points if you try referring to people in Italian! I feel like this post took me ages to put together, but I hope you like it and you get some inspiration for your next trip to Europe. "You might be a tourist, but you don’t have to look like one"
Sparkly necklaces and huge earrings say out loud "Rob me! I'm a tourist!". Italian women, as French, keep it super super with their jewelry. For them, it's only necessary to wear a couple of rings and a minimalist necklace or a pair of pearls in their ears to look classy and neat. I personally like to match more striking jewelry as a pair of statement earrings with a couple of less flashy necklaces or none at all. Avoid wearing sports sneakers and any kind of sports gear if you don't want to be spot as a tourist in Europe. People in Italy always look super put together and classy but effortless without even thinking about pairing a pair of sneakers with anything. Instead, when heading to Europe try shoes as ballerinas, low heeled booties or leather Oxford shoes with laces. They come in different models and lots of different fits and materials, and are super comfortable to rock cobblestoned street as well. In any European city full of churches and religious places which require what they call an "appropriate dress code" and covering up, shorts and tanks tops are a big no-no. Even in Summer. I used to wear a lot of these when I was younger, but now, even if I'm not religious and not entering churches in a daily basis, I changed my shorts and showy tops for flowy maxi dresses, palazzo pants and blouses. Flip-flops? No way you can walk on those! Cobblestoned streets are a serious thing that may cause serious harm to your feet. Even walking through them in regular shoes, it's been times that I've stepped wrong and I've been close to an ankle twist. So, flip-flops are a big no-no as well. You can't expect having your feet secured properly and consistently, without even mentioning the dirt and feet chafers you might get wearing those for long hours in any European city. Get a pair of proper shoes, and leave flip-flops for the swimming pool! I'll never get tired of saying this: in Europe, we mostly wear conservative clothing. I just don't know why, because although not being religious at all, it's like the common thing to do. Of course, it always depends in many things but mostly, we don't like to show a lot of skin. 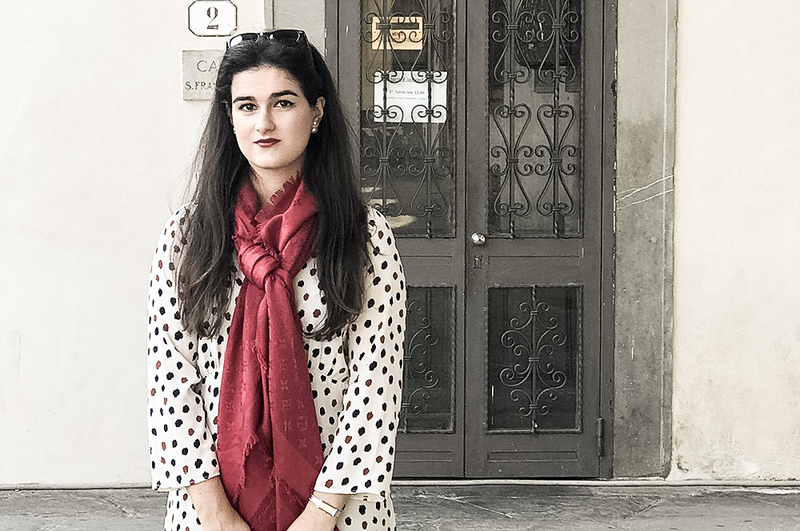 Even when it's not chilly at all, we usually wear in a daily basis scarves or light blazers (at least in Spain, however it depends a bit where you are based), maybe because the weather is quite crazy around here and you might get surprised by a sudden storm or anything. You never know! My advice here is always covering up a little bit; choosing long or medium jeans over shorts, and short sleeved T-shirts over tank tops. Bikinis and swimsuits are OK as long as you are heading to the beach or the pool, but not everywhere else! Unless you're fully equipped to run a marathon or train around your next destination, gym clothes have a purpose, and that's to serve well in the gym! As you might have noticed, here in Europe we have kind of an obsession with keeping sorted our clothing categories each of them in their own situation. Even for going for a quick grocery shopping or to the baker's shop, is not so usual to see someone in their sweatpants. Well, it happens sometimes. But it isn't a regular thing to be seen. Instead, we always go for a pair of comfortable jeans or boyfriend jeans, the pair of not-so-dressy shoes and a T-shirt or simple sweater. Keeping it basic while in Europe! I personally think huge backpacks, although super comfortable and useful, are for school or college. I can't deny I've already worn them in a couple of times here in Italy, as a matter of commodity to carry with me all the stuff I usually carry in every trip, even day trips! 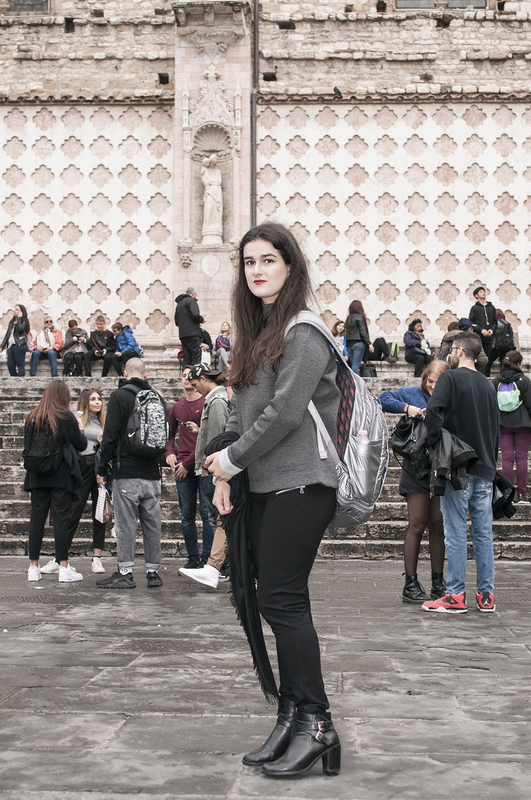 Plus, those backpacks are an absolute burden when entering the many museums and main attractions Europe has, as you'll usually have to store them and leave everything locked down on a separate room when visiting anything. So, my advice here is, if you're planning any trip through Europe, carry with you a small backpack or comfortable handbag on where you can keep everything that you might need (portable umbrella? My go-to. Scarve, notebook, card holder and pouch, even the photocamera...) but still it doesn't bother your way through a new place. And I think that's all for today folks! 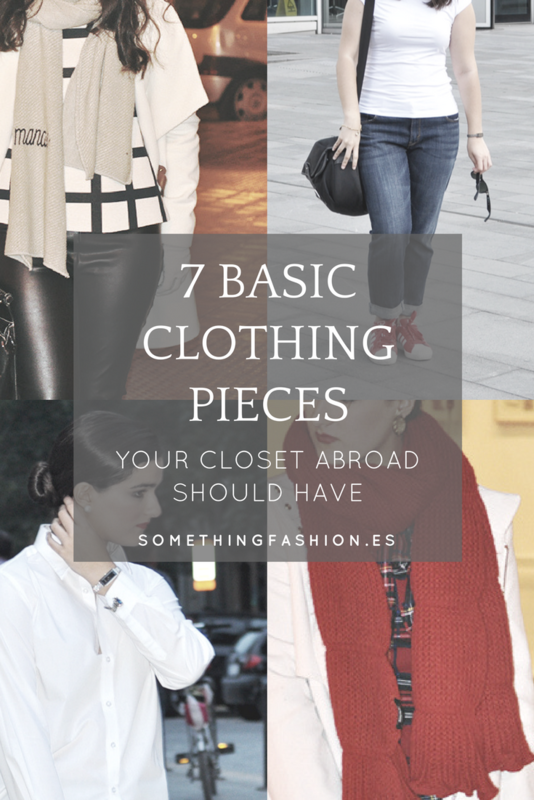 Do you agree in this tips for traveling fashionably to Europe? Are there some you'd like to add to the list? Do tell me in the comment box below!